for $489,900 with 2 bedrooms and 2 full baths, 1 three quarter bath. This 1,819 square foot home was built in 1975 on a lot size of 1.00 Acre(s). Pure beautiful mountain living! Great views, vaulted ceilings, fantastic rock fireplace for cozy winter nights, with awe inspiring windows making this home light and bright as you look West to the views and sunsets. Quiet setting away from it all while still being a quick drive to Conifer, Evergreen or the Denver area. 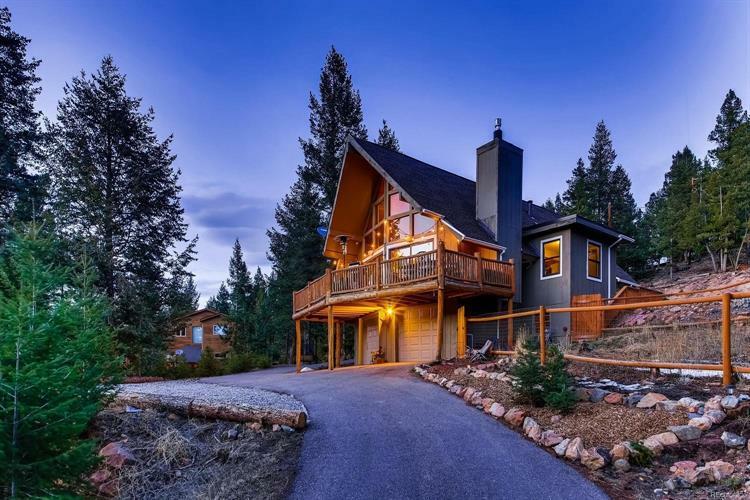 Sitting on one beautiful acre on the Western side of the mountain for maximum snow melt and views, paved drive way, main floor master with 5 piece bath and huge walk in closet. This home has recently gone through major renovations, new furnace, new paint inside and out, new roof with IR shingles, finished basement. The garage features an extra large work space/shop area, a fenced area for dogs, plenty of parking for guests and views from a large deck to die for, close to Flying J ranch for hiking and adventure. New Anderson sliding doors to the deck.